Welcome to my little boys’ room! I still have projects planned for this room but it is definitely at the “done for now” point. Let’s have a look around! My boys are best buds. Carter is 3 1/2 and Parker is almost 2. Both of them are in love with airplanes! It was an easy “theme” to decide on. Their room has a very tricky layout and angled ceilings so it took some thought to get everything in the “right place”. 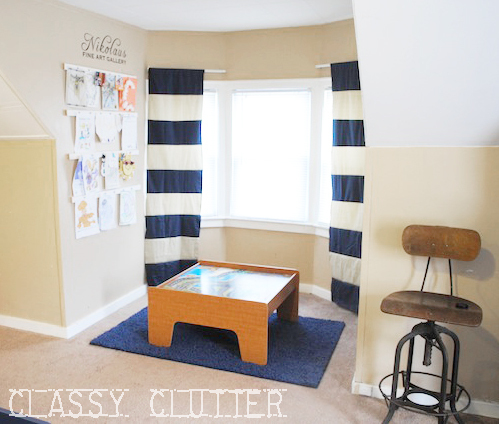 This room is absolutely perfect for the boys bedroom/playroom. It’s HUGE so it works well for sleeping and tons and tons of playing. This was originally going to be the Master for my husband and I but I couldn’t justify taking up all of that space for myself when I’m hardly in my room. I needed my boys to have a place to go crazy and make a mess! ha! Another cool feature is that there are 2 closets and it is the ONLY space upstairs so it is totally secluded from the rest of the house. It’s nice to have all of the toys upstairs! We do have a toy drawer in the living room but when it fills up I just run it upstairs and dump it in the toy box. It’s a great system! I love “progress” photos! It makes me realize how far the room has really come! You can really see the layout well in the “Before” photo. Those photos were from the house listing we saw when we rented the home! As you can see there is a ton of space and it had great potential for a kids space! I found their beds (which stack and convert to bunk beds) on Craigslist soon after we moved to New York. They were an absolute steal at $40 for both beds and mattresses. Seriously, how do I find these deals!? I was shocked and my boys love them. I wanted them navy blue after seeing a bunch of adorable navy beds at Pottery Barn, etc. 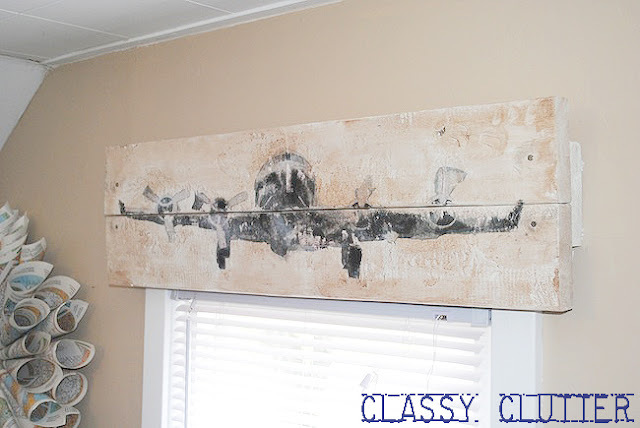 I made this rustic airplane valance out of two pieces of scrap wood! If anyone’s interested, I can do a tutorial on how to do it. It’s super easy! **Update** You can find the tutorial here. I made these printables to hang above their beds. They are New York state and the state of Arizona with a heart over the city where we lived. These are the two places my boys have lived so it seemed perfect to me. I made the pillow shams and throw pillows. 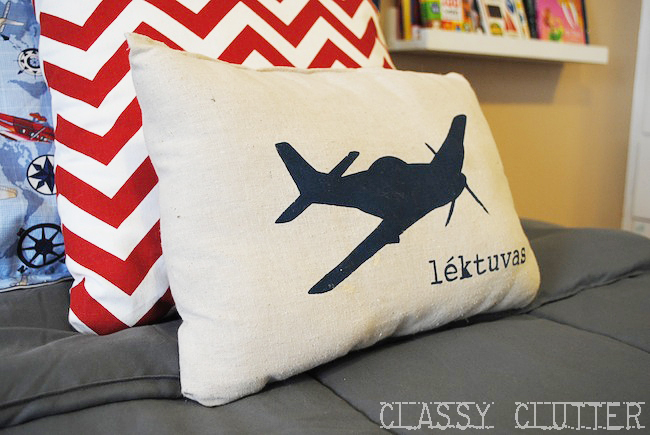 The vintage airplane fabric came from Hobby Lobby and the red chevron came from Fabric.com. The pillows in the front were made with tan linen and I used freezer paper and fabric paint to make the stencilled airplane and compass. This little side table was a roadkill rescue and it was oh so gross orangey wood colored before I gave it a few coats of Krylon’s Dual in Cherry Red. 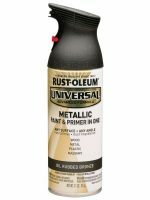 They hardware was sprayed with Oil Rubbed Bronze. I have since picked up an airplane knob and will eventually replace the drawer pull. 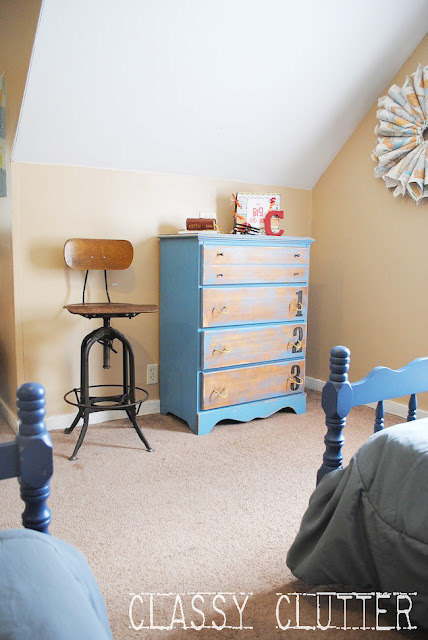 View my Anthropologie inspired ordinal dresser makeover here. That fantastic chair was also a roadkill rescue. All I did was clean ‘er off! I love that old school chair. Check out how I made my Kids Art Gallery Display here. I have to get new curtain rods for the curtains but I love the striped curtains. 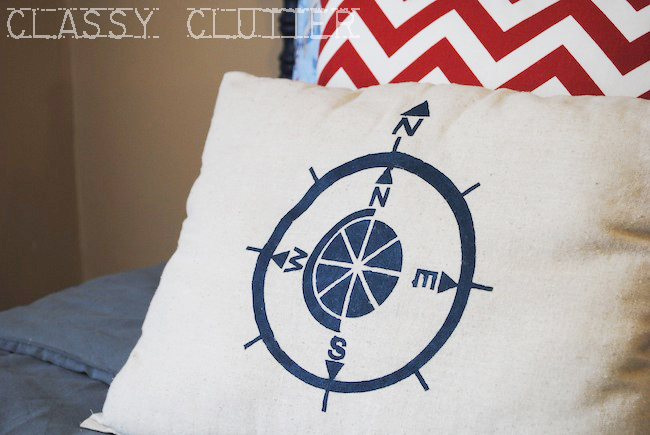 You can see the tutorial on the DIY Book Ledges (see top right) for a $1.00 here! Here’s my little Parker posing as I snap photos of his room. Anyways, I LOVE IT! I’m really happy with how it’s all turned out! What do you think?! Did you like this post? Consider sharing it on Pinterest! What a fun room for two brothers to grow up in! I love the color scheme, the furniture, the accessories! Awesome! 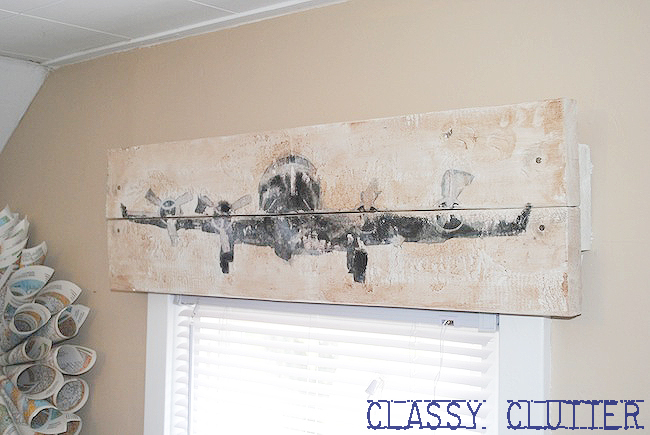 Please do a tutorial on the rustic airplane valance out of two pieces of scrap wood. I’d love to know how to do it! Thanks! Excellent job!!! The beds are perfect and who doesn’t love a steal of a deal. It really looks amazing. I LOVE it SO much! There isn’t one thing I don’t like about it. 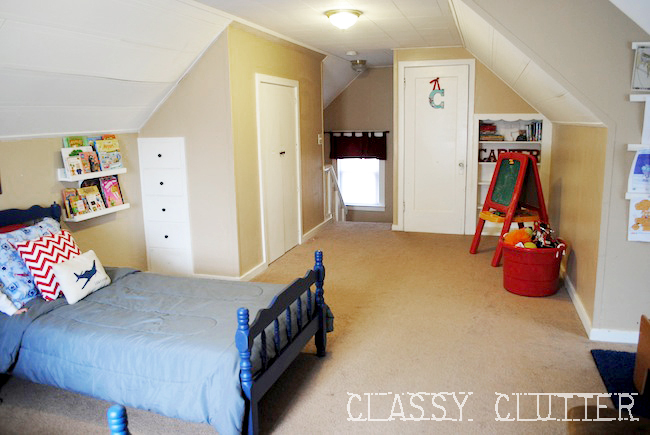 I think boys rooms have so many great options, and yours is amazing and classic. I hope someday I will have a little man to make a room for. Did I say, I LOVE IT! You have done an amazing job here. The drawer pulls are so clever. I like how you did so many of the pieces yourself. can i tell you how I am dying at your road kill rescue! i just bought those same bar stools at restoration hardware and lOVE them! they are awesome! 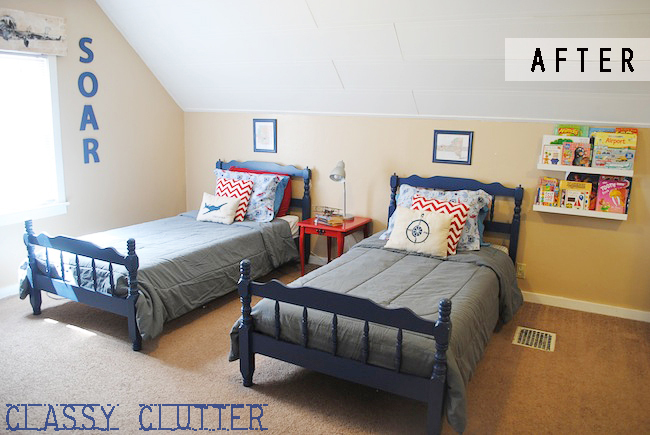 what a great job on your kids room! looks great! good idea with the airplanes! way cute! it looks amazing, mallory!!!! 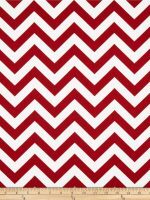 i actually used that same chevron in my son’s room for curtains (red also!). and he has two maple beds i wasn’t going to paint because everything else is painted, but now i am rethinking- i love these! yes please please please do a tutorial for the airplane valance . . i actually just saw the same thing (it was art work out of wood not a valance) in the pottery barn catalogue and i ripped it out and it’s been hanging in my craft room for inspiration :)it’s soooo cute!! 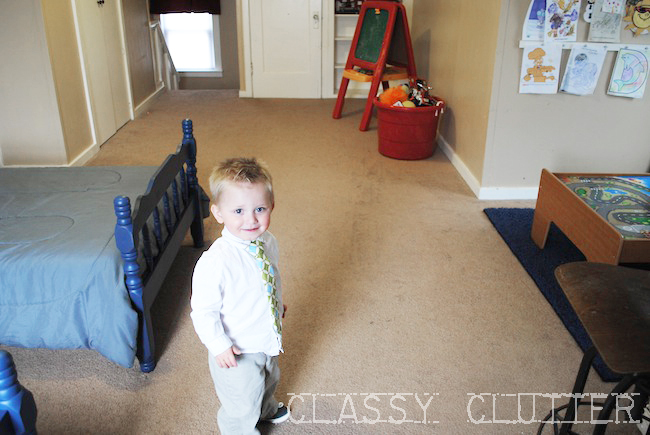 That room is too cute…and your little boy in his shirt and tie is even cuter!! Love the airplane valance on the window too! Love the colors and the theme! Wow looks fantastic. Love the blue beds and what a steal you got on them. Great job. 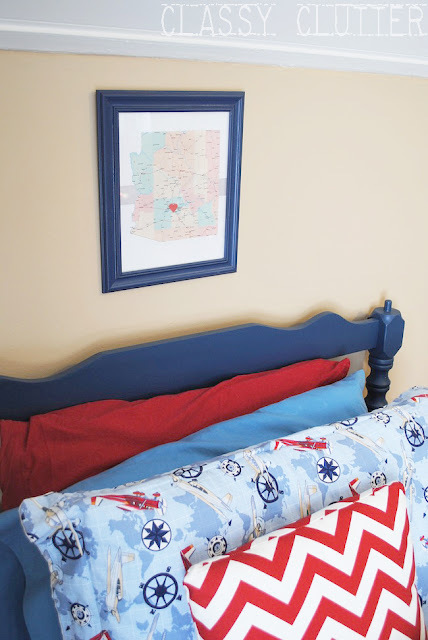 I adore all the personal touches, it’s a perfect little boys room! 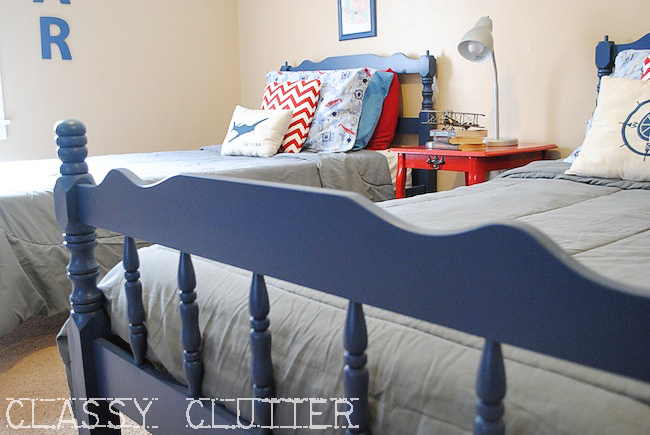 The beds look amazing painted navy blue! Great work! Oh goodness, Parker is ADORABLE! And I love the room you’ve created! It’s perfect! that looks fabulous! painting the beds made a huge difference, and i love the little game (that’s what that is, right?) alcove! Yes! YES! on the Tutorial for the Airplane Valance! Love the blue beds! The whole room looks great! Wow! Very cool. I love the airplane valence & curtains! SO darling! 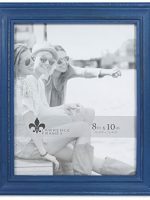 i would LOVE for you to link this post or any other posts you want to my weekend link party http://lovenotesbylauryn.blogspot.com/2012/04/spread-love-link-party-6.html it opens at midnight tonight, hope to see you there! I love the airplane above the window! I need to know how you did it! My daughter is in love with airplanes and I would love to see how to make it! What a great room. I love how you made it an airplane theme without going way over the top. It is perfect, since it is mature enough for them to grow into! Nice job! 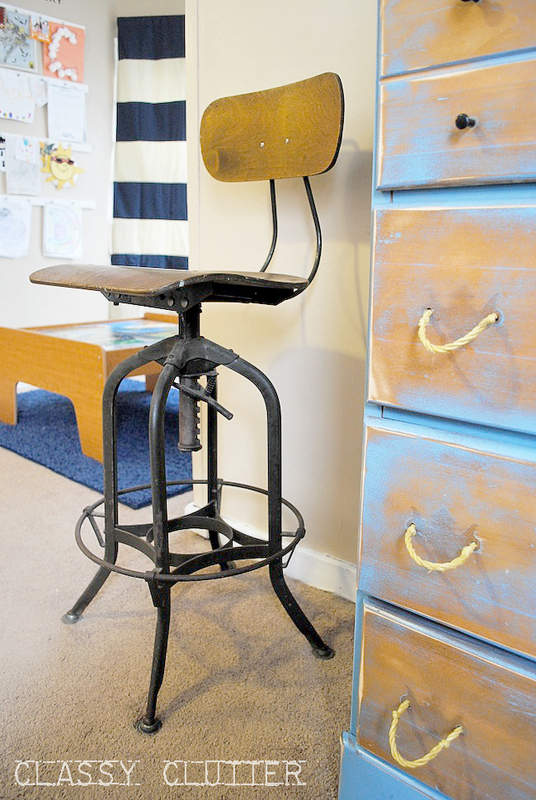 This is such a cute and classic boys room! I’m also quite partial to navy furniture for boys. Great job! Such a fantastic room! I love the wooden window valance especially. 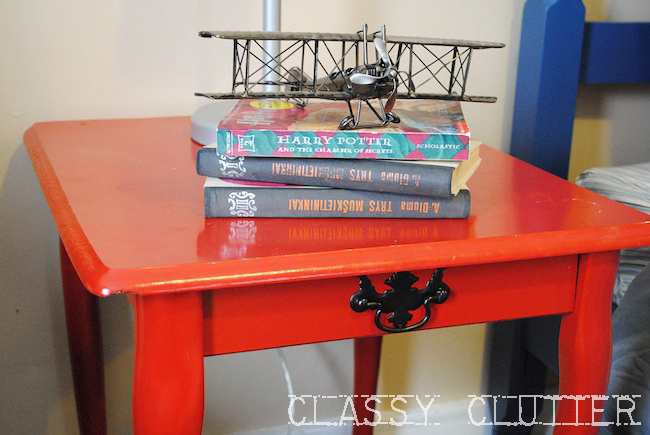 I LOVE this and would definitely love the valence tutorial – I’m just starting my son’s vintage airplane room and that would go perfectly (it looks like the Pottery Barn version). Wow! Great job! So many things to love! I love your son’s airplane room! I’m in the process of redoing my son’s room as well. Seeing yours all done gives me motivation to finish the last few details. Thanks for the inspiration! So cute! I love the painted furniture! I have been painting some for my little boy’s room too! I would love for you to share this (and any other creations) at “Pin It and Win It Wednesday” @ http://www.cheapcraftymama.com! What a fun boy’s room!! I love all the details! I love the stenciled pillows and that school chair! 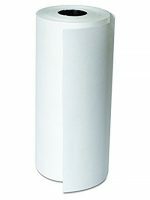 I’d love to find one of those to put in my craft room! I found you via HOH. Amazing. Smitten with the window treatments. I love it and would love if you linked it up on my link party. I am in love with this room. I find myself wishing I had boys when I look at your pics. Just adorable. I would love if you stopped by to link it up to my party happening NOW! I would love to have you there! What an amazing room! Did you make the striped curtains or buy them? I love all the fun details in the room. what lucky boys, the room is wonderful! you did a lot of work on….beautiful room…look just perfect..like it. What a darling space. Love the beds and night stand painted! YOu made this space amazing! What a precious little boy too! He’s very lucky to have that room! WOW! This turned out ADORABLE! I love the colors that you chose. This is an amazing room! One that can grow with them as well. Fantastic! I love the bed colour. Really Cute! this is an awesome bedroom!!!! Perfect! This is absolutely incredible! My son is in a phase (will it be just a phase?) where he is OBSESSED with airplanes. The valance is especially of interest to me. Thank you for posting the tutorial. 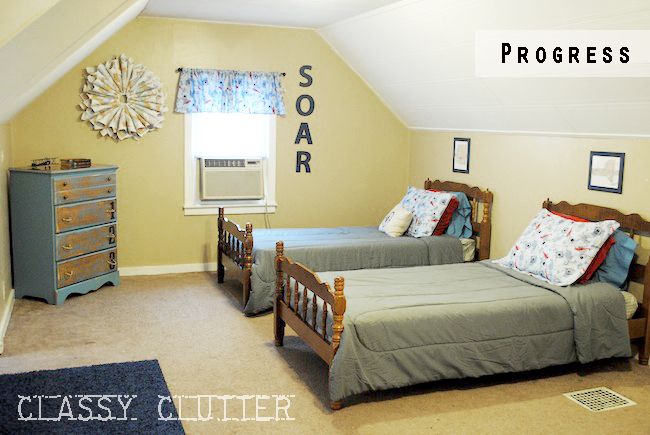 It looks like so much thought work and love went into creating this room for your boys! super cute!!! I think I have seen your airplane tutorial around before, but just seeing the room now :o) I came over from Six Sisters Stuff to invite you to sign up to win one of three photo books up for grabs. come on over and enter the giveaway!!! Ok so I have been thinking, planning, dreaming of a room and I had almost the exact same plan going on in my head for ever & it’s amazing that days before we start the “work” I finally find your blog!!!! You were so generous to share w us your well thought out room & cover ALL the key points I imagined & bless me w a visual!!! And I am a NY-er too!! This couldn’t have been anymore perfect!!! And did I mention my boys will also be sharing a room w that awkward pitched ceiling. Thank you for such a wonderful preview of my idea & lending me some of yours. 🙂 my question though is the maps, any recommendations on favorites? I am using places visited as our theme but I haven’t had much luck finding any maps as lovely as the ones you used. Thanks. Melissa hydrenna@yahoo.com hope you guys are warm heard upstate was hit hard by much snow. This room is adorable. I love the valance and pillows and all the finishing touches. You did an amazing job on this room, what lucky boys you have! Fabulous@ What an adorable shared space! I love the personal and handmade touches – it makes the room feel thought about and collected rather than purchased from a catalogue. You did an amazing job! What a fun room! With a little hint of realism using the rustic plane design and that wonderful looking cabinet! It looks nice that you incorporated a bit of a rustic look into it, completing the air force experience with your closets Bergen (for instance) as I see it. It is an absolute beauty! I love how this room turned out! I really love the striped curtains and have been looking everywhere for them. Did you make them? Do you know where I can find some? Hi Jenny! I made them using cream and navy black out curtains from walmart! All I did was cut them into strips and sew them together! Easy peasy! Thanks for stopping by! Love this room! I have three boys and the younger two share. 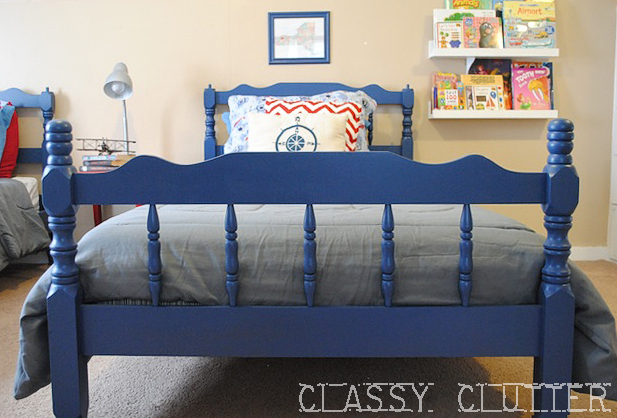 I have old beds that were my husbands that I want to paint and I think the blue you selected is PERFECT. Mind sharing the color/finish? Thanks and GREAT work! 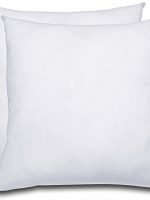 My husband is Lithuanian, so it was the pillow that drew me to your site. I must have one of those! My son will love it! I plan on doing the valance too. So cute! No way!!! So cool! My husband lived there for 2 years and speaks Lithuanian fluently! That is so cool! Thanks for stopping by! This room is adorable. 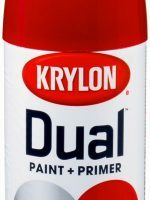 I am getting ready to paint my son’s bed navy also…could you tell me what paint color you used? Thanks so much! Hello where did you get the airplane pillow?